Watch as Davison’s Better Way to Invent turns Melanie’s Half and Half Pan idea into a store-ready reality! Melanie was an “on again, off again” baker from Chicago, who only baked when the moment struck her. While baking brownies in the kitchen one day, Melanie began to cook up a product idea that would provide a Better Way to quickly and precisely cut a tray of brownies into the same size. When Melanie came to Davison, she had already spent a lot of time and money on a patent for her idea. However, things changed when buyers showed more interest in cupcakes and not brownies! With cupcakes in and brownies out, Davison invented the world’s first Half N Half Cupcake Pan for Melanie – a fun twist on an old favorite! Though Melanie’s battle with cancer ultimately took her too early, her brother, Richard, is proud to see the success of his sister’s invention. Chicago-native Melanie Anderson, a baker only on occasion, became frustrated knowing that there wasn’t a simple way to quickly and easily cut a pan of brownies into even squares. So, Melanie started cooking up her own unique ideas in her home kitchen. Melanie’s original idea was to invent an object that could cut an entire tray of brownies just by pressing it into the brownie pan. 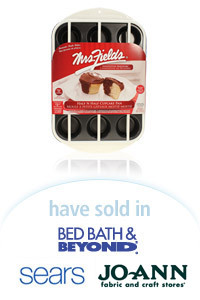 However, with Davison’s help and buyer-interest knowledge, the brownie-cutter concept was transformed into the Half N Half Cupcake Pan that’s now licensed by Mrs. Fields, has been featured on QVC, and has sold at various retailers!